Hi friends. Thanks (as always) for all of the great responses to weekend reading. I’m finally back from Austin, but the trip home was colorful to say the least. I was supposed to leave early on Monday, but two flight cancellations and a detour to Ft. Lauderdale later, I found myself flying into D.C. at 1am. I waved to the District was driven home in the wee hours by two very kind strangers who had become friends over the course of our 12 shared hours at the airport. The New York skyline was a sweet sight when we pulled in at 6am, weary but with our enthusiasm for 80s playlists intact. So I’ve spent the better part of this day trying to catch up on work and rearrange my clients. In the spirit of a hectic day, I wanted to share a quick recipe that I’d whipped up last week, before Vida Vegan Con. 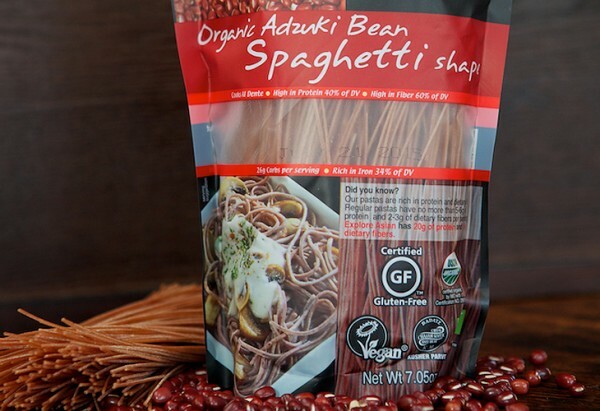 The centerpiece of the dish is adzuki bean spaghetti from Explore Asian Foods. Embarrassingly, I received the noodles last spring, courtesy of the kind folks at Explore Asian, but in the whirlwind of moving, I never had a chance to share them with you all. I really liked them, though–so much that I was inspired to pick them up again. This time, you get the full report. 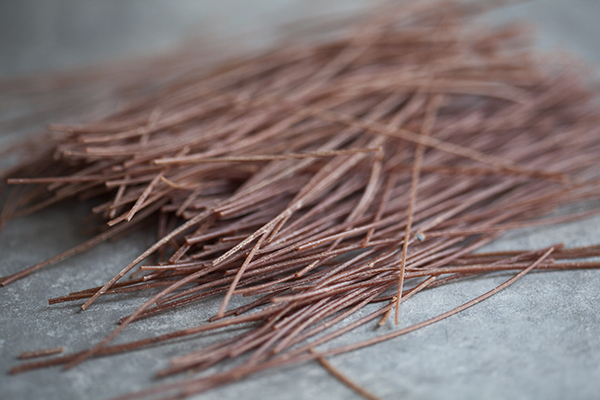 As you can see, the noodles have a thin texture and a cool, rust color. I thought they’d be impossibly grainy or tough, but they’re not at all. They cook quickly and become very tender, but they retain a lot of pleasant, al dente chew. 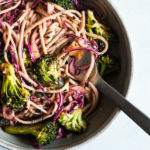 I don’t love all non-traditional pastas (I’m not a huge fan of either whole wheat or black bean, and I think shirataki noodles are pretty bland), but I do think these noodles are great. 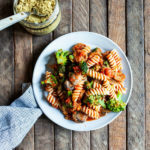 And, as with many legume based pastas, they’re packed with nutrition. One serving packs in 20 grams of protein, 15 grams of fiber, and 34% of the RDA of iron. That is very impressive for noodles! 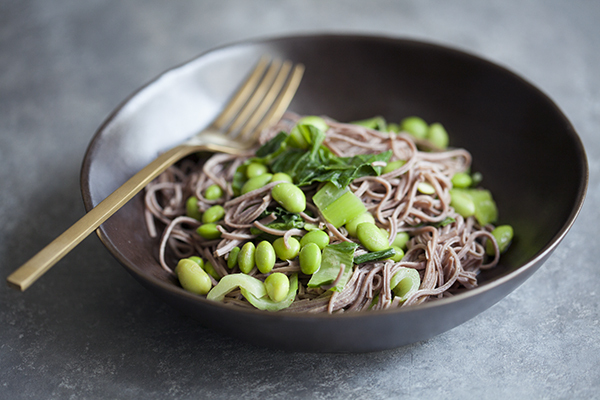 I’m not in the habit of calculating protein information for my recipes and don’t intend to make it a habit, but I did note that a serving of this dish has about 30 grams of protein, thanks to the edamame, noodles, and bok choy. It’s a perfection option for anyone who’s trying to increase his or her plant-based protein intake. Nutrition information aside, this is a great lunch dish. 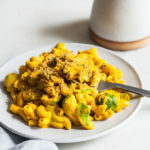 It’s flavorful, full of texture, and it comes together really quickly. If you make the miso sesame sauce one day in advance, it’s even faster to prepare. I used frozen, shelled edamame, which added a delightful chew. For those of you who may have soy allergies or intolerances, you could use black beans, garbanzos, or even frozen green peas. As for the greens, you can use whatever is in season. Kale, spinach, and chard would all work well here. To prepare the dressing, whisk or blend the rice vinegar, miso, tamari, maple syrup, almond butter, sesame oil, ginger, and water together. Set the dressing aside. Bring a large pot of water to a boil and a medium pot of water to a simmer. Place the adzuki noodles in the large pot and cook them, stirring frequently, till tender (5-6 minutes--they cook fast and stay al dente!). While the noodles cook, place the chopped bok choy into a steamer attachment or a strainer, and steam them over the medium pot of water till tender (2-3 minutes). Remove them from heat and shake them dry. Set the greens aside. 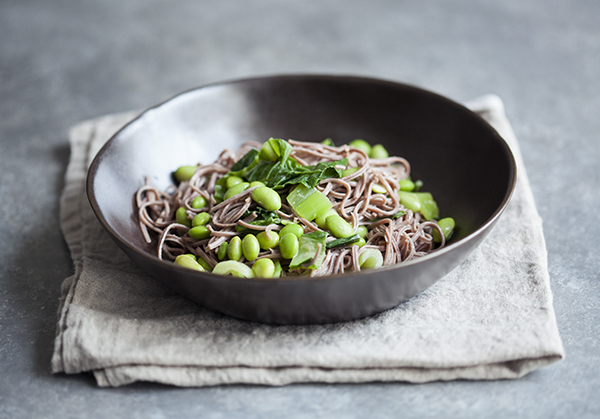 Mix the noodles, bok choy, and edamame together in a serving bowl. Toss the dressing over the noodles and mix everything well. Divide the noodles onto four plates and serve. Stored in an airtight container in the fridge, the noodles will keep for up to three days. If you cook and throw things together quickly, the noodle dish will be gently warm from cooking. 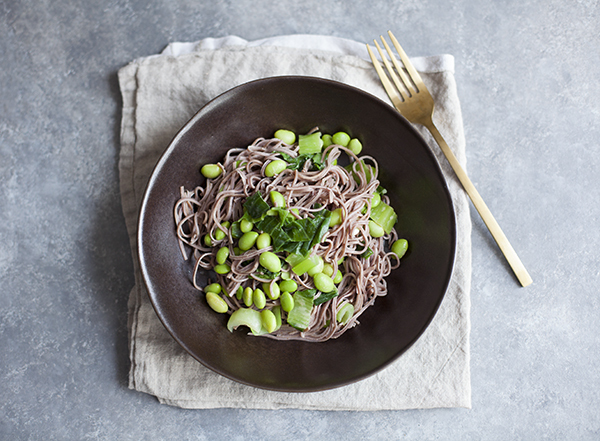 But you can also refrigerate the noodles prior to serving, and turn the recipe into a cold noodle salad. Having enjoyed the leftovers a few times, I almost preferred it that way. Hopefully you’ll this quick, nutrient dense dish. If you’re looking to pair it with something, a bowl of miso soup would be perfect, as would a cold soup over the summer–my chilled cucumber and avocado soup would be lovely! Enjoy, friends. I’ll be back later this week with a scrumptious raw dessert and an awesome new giveaway for you all! This dish is my kind of food – quick, simple, nourishing and full of veggies! I make versions of something like this often as Woodrow will always gobble noodle dishes up. the recipe would work with adzuki, which I am so found of! My beans are presently in the dehydrator to make the flour. I’ve seen various bean-based noodles at the store but was scared of them for fear they’d be bland and gummy. Thanks for the review of these! I am going to give them a try! The protein content is amazing but it’s not really enough of a concern of mine to make me get them again. 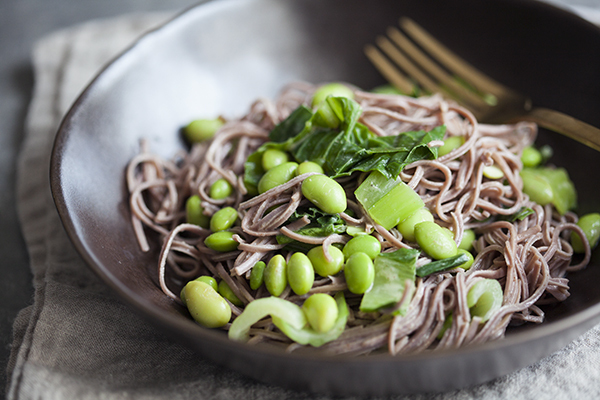 I’d love to try this dish with soba or brown rice udon noodles though! That dressing is definitely right up my street. Glad you made it home though. I love Explore Asian noodles! I’ve tried the black bean ones and the mung bean ones, but haven’t had a chance to try these ones out yet. Perfect recipe to try them with =) I love how protein-packed their noodles are.